Southern Maryland Meats product line includes: Beef, Pork, Poultry (Chicken, Guinea Hens, and Turkey), Lamb, Goat, and Rabbit. All products are produced/raised in the five Southern Maryland counties of Anne Arundel, Calvert, Charles, Prince Georges and St. Mary’s. Some farms are able to custom-grow or custom process their animals. Contact the individual farms for more information. Each farm raises, feeds and finishes its animals according to its own style and preference, however, to use the SMM brand, the farm must pledge to uphold strict standards of quality and humane care, and to use clearly defined terms (see glossary below) when marketing its product. Each animal is raised and processed according to our high quality standards to ensure the finest meat locally produced. To use the SMM logo, farmers agree to uphold official quality standards (read our full standards below). Buying local meat should be simple. That’s why Southern Maryland Meats has created these helpful consumer resources. 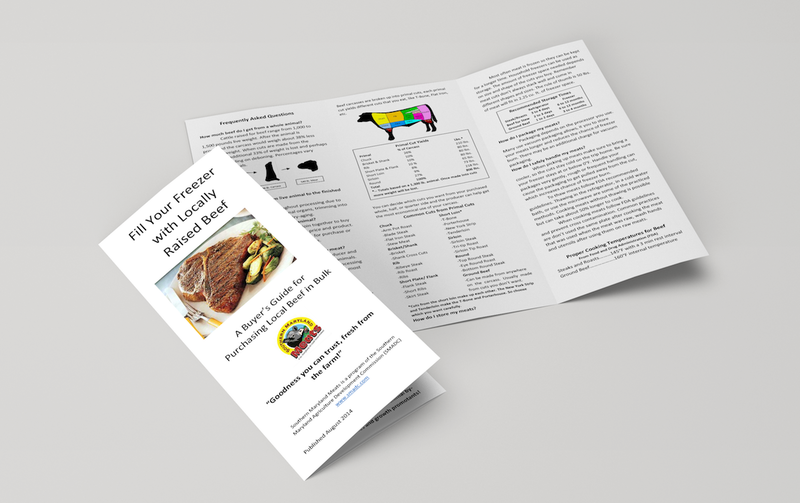 Understand the local meats our farmers produce, how to use a “cut sheet” for custom orders, and why frozen meats are a smart and healthy choice. Participation in Southern Maryland Meats (SMM) program is voluntary. Farmers in SMM must agree to the following general standards when marketing their meats through the SMM program and are eligible to use the SMM logo and display cases. Meats for retail sale to stores, restaurants and farmers’ markets are slaughtered and processed at USDA-inspected facilities and compliant with DHMH On-Farm Processor license requirements. Poultry and Rabbits for retail sale to stores, restaurants and farmers’ markets are slaughtered and processed at farms certified and licensed by Maryland Department of Agriculture for On-Farm Poultry/Rabbit Processing. Southern Maryland Meats participants agree to uphold the following standards. If a feeder animal is finished in Southern MD AND is finished and processed according to the Southern MD Meats guidelines, it can be accepted under the Southern MD Meats label. Humane treatment: Feed containing mammalian-derived protein sources is not permitted, with the exception of milk and milk-derived products. Consistent labeling: Correct use of the terms “grass-fed”, “grass-finished”, “corn-fed”, corn-finished” in product labeling. Strict standards: No antibiotics administered unless medically necessary. No growth implants. No sick animals slaughtered for human consumption. Grass-fed: Grass and/or forage shall be the feed source consumed for the lifetime of the ruminant animal, with the exception of milk consumed prior to weaning. The diet shall be derived solely from forage and animals cannot be fed grain and must have continuous access to pasture during the growing season. Diet should not be supplemented with grain, animal by-products or *hormones. Animals may have access to free choice mineral to ensure their bodies get needed nutrients grass may lack. Protein tubs are not acceptable in grass fed protocols. Feeding molasses protein tubs to grass fed is prohibited. Grass-finished: Finishing is just another word for the time that cattle are normally fattened for the last few months before processing. Typically, feed lots finish cattle for 90 to 160 days on grain, usually corn, whereas, grass finished cattle are fattened on grass only until the day that they are processed. Diet should not be supplemented with grain, animal by-products or *hormones. Animals may have access to free choice mineral to ensure their bodies get needed nutrients grass may lack. Protein tubs are not acceptable in grass fed protocols. Feeding molasses protein tubs to grass fed is prohibited. Grain/corn-fed: Cattle raised on pasture from birth to about 7-9 months, then fed small amounts of hay or straw supplemented with grain, soy and other ingredients. Fed a balanced diet that includes grain. Does not necessarily mean feed lot, animals are supplemented with grain to make up protein content that cannot be obtained from environment. Grain/corn-finished: Cattle fed hay or straw supplemented with grain, soy and other ingredients for a minimum of 90 days. Fed grain to increase fat content on the animal. 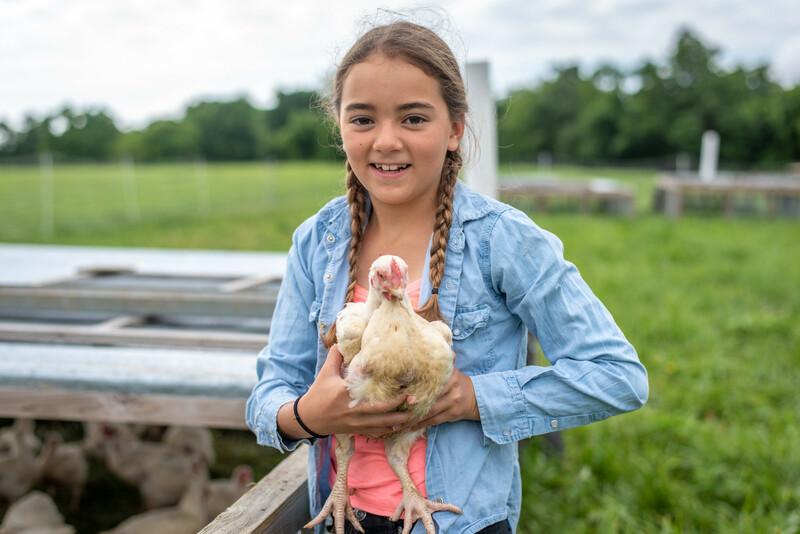 Humane treatment: Animals in the Southern Maryland Meats program are humanely raised on Southern Maryland family farms. The animals are able to express normal behaviors and live in an appropriate and comfortable environment that includes sufficient space with appropriate access to the outdoors and pasture. Animals have proper facilities with clean and sufficient food and water, shelter, a resting area, and company of their own kind. Animals have a healthy life, benefiting from disease and injury prevention and rapid diagnoses and treatment. Farm owners have a good working knowledge of their system and the animals in their care. Southern Maryland Meats animals are also humanely transported and slaughtered. Animals for slaughter must be raised under organic management from the last third of gestation, or no later than the second day of life for poultry. Producers must feed livestock agricultural feed products that are 100 percent organic, but may also provide allowed vitamin and mineral supplements. Dairy animals must be managed organically for at least 12 months in order for milk or dairy products to be sold, labeled or represented as organic. (Dairy producers may use land that is transitioning during its third year of transition to organic certification to provide crops and forage for dairy animals during this 12-month period prior to the sale of dairy products as organic). Organically raised animals must not be given *hormones to promote growth, or antibiotics for any reason. Preventive management practices, including the use of vaccines, must be used to keep animals healthy. Producers must not withhold treatment from a sick or injured animal; however, animals treated with a prohibited medication may not be sold as organic. Pasture-raised: Animals spend their lives outdoors, on pastures (barring birthing, inclement weather, and other limited circumstances) and animals forage for significant portions of their diets. Animals are able to go about normal behavior such as nesting, grazing, etc. Soy-free: Animals are fed a diet that gets the protein from a source other than soybean products. Animal feeds do not contain soybean meal, whole soybeans, extruded soybeans or any other soy based products. GMO-free: GMO are plants or animals that have been genetically modified by inputting DNA from other species. Animals are fed a diet that is free from any genetically modified organisms. GMO free feeds are identified by the feed labels. Dry-aging: Dry-aging is a process that tenderizes meats, concentrates the flavor and produces a superior taste and texture. Dry-aging is costly because the process requires time and expertise. Meat that is dry-aged is hung for extended periods of time in a specialized cooler at carefully controlled temperatures and humidity levels.